In a dark but not to distant past, a pint of lager was all you could get if you wanted beer with your meal. Luckily this has changed. Good food deserves the company of good drink, and at Ægir we make a variety of quality beers to choose from no matter what the menu is. If you´re having salty or sweet food, seafood or cured food, grilled foods or goose liver, cake or chips - in our range you will always find a matching companion. On this page you will find tips on what beers to match with different courses - that we hope can contribute to making your food experiences even better. Our copper-coloured IPA is brewed in the classic Northern California style and features piney and citrusy hop flavours backed up by a malty backbone. Medium-bodied and yet easy to drink, Ægir IPA has a long and satisfying finish that goes well with lamb, beef, fat fish, ripe cheese and spicy food. A crisp and tart thirst quencher, this rye ale goes through two fermentations to give it a light sourness. The beer is also added local sweet cherry juice giving it a unique aroma and flavor profile. A dry and refreshing summer beer that pair well with strong cheeses. Golden and easy-drinking variants of the same beer style with fruity notes. 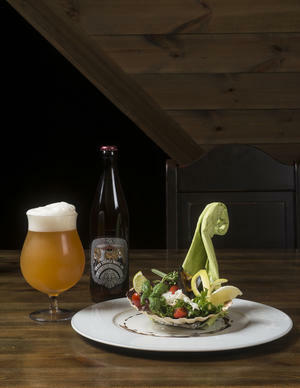 The beers have a mild aroma with hints of freshly baked bread and citrus from American flavor hops, making them a perfect partner for sea food, white meat, salads and cheeses. Deep red in colour, this Amber Ale includes six different malt types in the grain bill. Flavors with hints of toffee and caramel, but still light in mouthfeel, this is a great companion for barbecue, cured meats and cheeses. This is our version of Scotch Ale, a brew also known as Wee Heavy. The beer is full-bodied and malty with a hint of peat smoked malt. A good companion for heavy meat dishes, wild game, tasty cheeses and grilled foods. Exciting tip: Make a bacon marmelade, spread it on some good bread together with brie or camembert cheese. Yum! Our Pale Ale with dried orange peel and aromatic American hops provide a citrusy flavor and aroma. This beer is crisp and dry and makes a great match with chicken, cheeses, salads, shellfish and spicy foods. Witbier is a Belgian beer style where spices such as coriander seeds and orange peel is used in the beer together with a very fruity yeast strain. We made a hybrid between this style and IPA as a collab with Beavertown from England. These beer styles go very well with lots of different foods such as salads, white fish, shellfish and our favourite; ceviche. Ceviche is a Latin-American dish with fresh raw fish cured in citrus juices, such as lemon or lime, and often mixed with onion, avocado, cherry tomatoes and lots of fresh coriander. 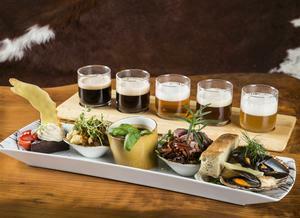 The similar flavors in the beer harmonize well with the same in the food and the combination is yummy! A session IPA with an upfront hop aroma with flavours of tropical fruits and citrus completed by a refreshing and dry finish, making it a good companion for spicy food. Try it with Indian or Mexican food, maybe with a homemade habañero salsa and lots of fresh coriander. Black as night, soft as silk and strong as a bear. This Imperial Porter has flavours of coffee, chocolate and roasted malt - and a bit of citrusy hops. 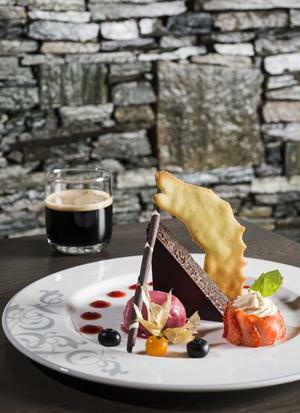 A full-bodied beer that is an unbeatable companion for dark chocolate and rich desserts. This is a version of our Imperial Porter that has been aged for months in Whiskey barrels from Lynchburg, Tennessee. An exquisite balance between oak and American whiskey together with tones of coffee, vanilla and licorice - making it good company for chocolate desserts or a classic Créme Brûlée. Our strong and full-bodied version of American Barleywine, with a deep red colour and striking hop character. This beer has big flavors of apples and dried fruit and a long and complex aftertaste, making it a perfect companion for lamb dishes, ripe cheese and rich desserts. A fruity IPA, perfectly balanced to make Goldilocks happy. An aromatic and light IPA with a dry and elegant finish, that pairs well with barbecue, seafood or different cheeses. Wheat malt, coriander seed and orange, lemon and lime peel give an aromatic and unique beer with low bitterness. This beer is the perfect partner for salads, mussels, light meat dishes and fish - try it instead of white wine! We´ve added a bit of fire to our otherwise light and elegant Munich Helles lager, by adding a fresh and homemade extract from habañero chili peppers! We´ve managed to capture the flavor and aroma of the chilies, and just enough of a spicy kick without it being overpowering. Try it with grilled foods and tacos, or your favourite sour cream dip. Olé! A light and flavourful beer with delicate tones of coriander seed and orange peel over a backbone of unmalted wheat. Goes well with all types of seafood, ceviché and lighter dishes. A non-alcoholic pale ale that is hoppy and refreshing with a light mouthfeel. Works well with pizza, seafood, salads and other lighter dishes.